in the electronics, optics, medical and tooling industries. A complete selection of reusable containers. 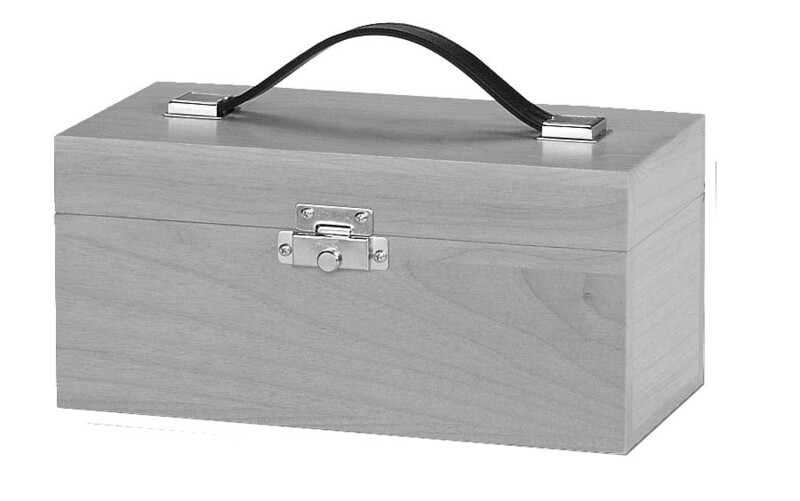 The SCHRY-WAY L1 Series of hardwood cases is designed for light weight applications. These high quality cases are designed to both protect and display their enclosed products. The ridged nature of wood provides excellent protection against crushing and puncture and when combined with custom fit foam inserts has excellent shock absorption qualities. These cases are finely sanded and finished with a gloss water resistant finish. This series is constructed from Alder which provides a rich warm appearance and enhances the product enclosed. These cases are intended for use in a variety of industries such as optics, electronics, medical, and tooling. They are the best way to package delicate instruments for storage and display. The inside dimensions of this series range from 3" to 18" in length, 3" to 12" in width, and 2" to 6" in height. Standard sizes are listed in the catalog. Custom sizes are also available in quantities. Call us for pricing, or click here to request a catalog.